"Look at me honey, I'm using technology! Ain't got no time to make an apology. Love in the middle of a firefight." Seventy-eight megaseconds ago, a hyperspace traffic monitor AI recorded a vessel transponder signal from an unmapped node. 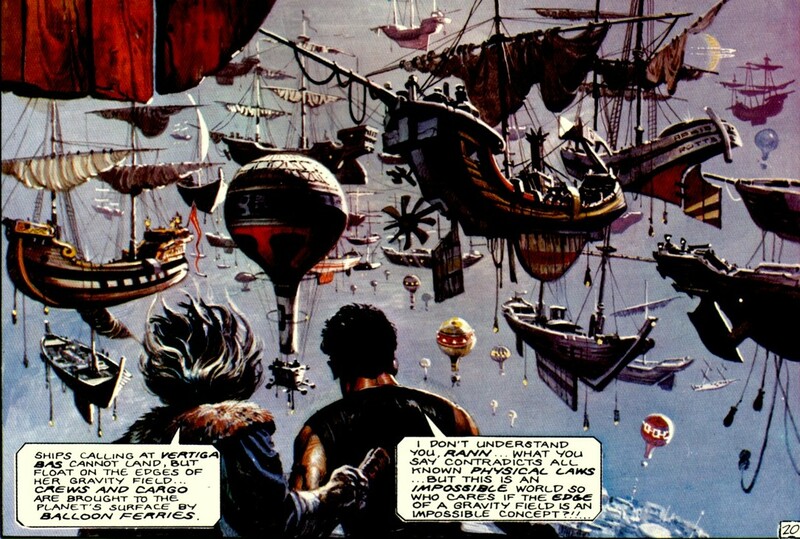 The vessel was Golden Dawn, a pleasure yacht registered out of Smaragdoz and belonging to pop star Xeno Stardust. Stardust, his band, and his entourage disappeared during a short cruise, ostensibly for the recording of their new album. 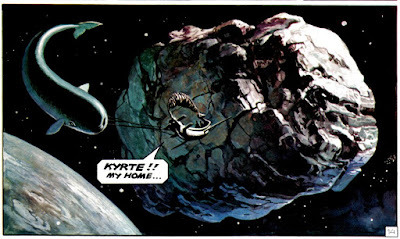 When a search failed to discover their whereabouts Stardust corporate filed an indemnity insurance claim--a claim currently unresolved and under investigation. The insurance company gave you the job, and it sounded like an easy one: IP salvage. Get to Golden Dawn and recover any new music. Bringing Stardust back alive would be optimal, but a partial brain download, recordings, or even partial recordings are worth something. It isn't going to be that easy. Golden Dawn is stuck in the event horizon of a malfunctioning hyperspace node. At least some of the passengers are still alive, but drugs, ego, and isolation in warped spacetime have taken their toll. Making it out with a lost album? You'll be lucky it you make it out alive. I first mentioned the Leviathan series by Scott Westerfield a while back. 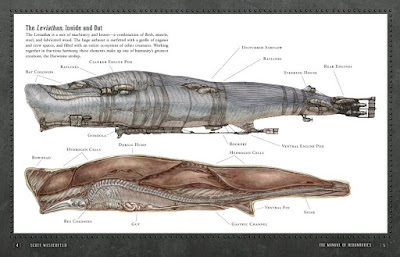 I just stumbled across a companion to the series The Manual of Aeronautics that is essentially a technical manual to the series, lavishly illustrated by Keith Thompson (who also does illustrations in the novels). It's a great companion if you dug the series and interesting even if you haven't read them books. The only faults I can find with it is that it is only a slim 64 pages long and it's a portable 7x9 instead of something in more of an artbook 10x12 range. 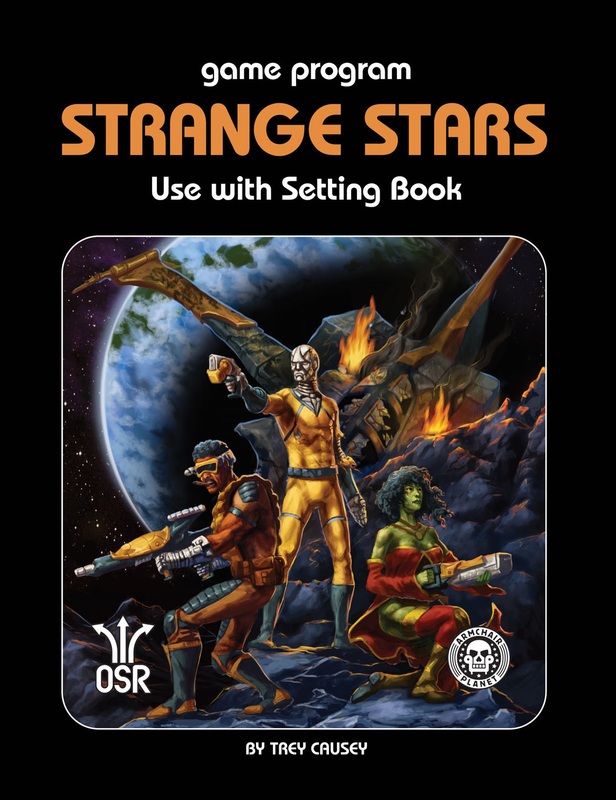 GusL over at the Dungeon of Signs wrote a thorough review of Strange Stars OSR yesterday that you should read if you haven't. 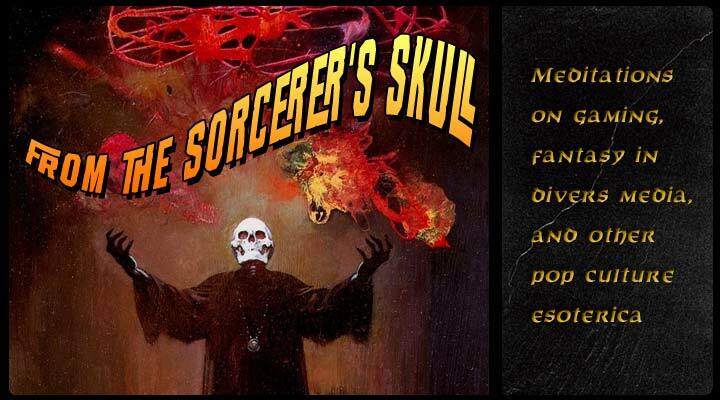 You should also stay to check out Gus's blog because he does good stuff outside the bounds of bog standard Medieval fantasy. You Fate guys need to to get the people some Strange Stars Fate reviews! The thaumaturgic forces unleashed by the Great War have left much of Ealderde strange. For an example of just how weird this transformation can be, one need look no farther than Lumière,the former capital of Neustrie and the Gallian Alliance. Once Lumière’s lights were emblematic of a city that never slept, a place of art and culture. Today, Lumière is a bombed out ruin, and the amber luminescence that crawls or flows through its streets and buildings is something of another world. The thing is alive; almost everyone agrees on that, but little they agree on little else. Is it matter? Some gelatinous substance similar to the strange denizens of the underground? Or is it pure energy, somehow thickened and held? If it’s the latter, it’s light with no heat. In the day, it seems to hide in the skeletons of buildings, perhaps fearing the sun. At night it pours forth and spreads out over whole blocks. Rats and vermin flee it. Living things it touches develop strange tumors or growths. When it first rose, victims caught in its path were left rooted to the spot, transformed into masses of cancer. The glowing touch of the thing seems to have created at least one mutant species. The wild swine that moved into the city to root and scavenge after the devastation of the war have been changed. They've grown large, and bloated and pale as grubs, with eyes that glow with a paler yellow that the thing. Though they can’t speak, they seem to have evolved an evil intelligence. They roam the streets in herds, seeming to take pleasure in spoiling what remains of the works of man, and looking (though they're hardly picky eaters) for their primary form of sustenance: fungal spores. The Mushrooms, the swines' unrelenting foes, resent their progency being consumed by the swine with a displeasure that's more cold practicality than horror. These fungal sapients likely lived beneath the city even in previous times (certain legends hint at their presence) but when the humans fled they saw an opportunity. From their inhuman alchemical laboratories they create structures from fungal stock and weaponize molds to strike at the swine and keep humans away. Looters and treasure seekers make forays into the ruin of Lumière, but it's a dangerous undertaking. Even if the poured-honey creeping of the luminescent thing can be avoided, there are the packs of hungry swine to be outwitted, and the silent and dispassionate Mushroom scientists to be dealt with. My exploration of the long-running euro-comic Storm, continues with his adventures in the world of Pandarve. Earlier installments can be found here. 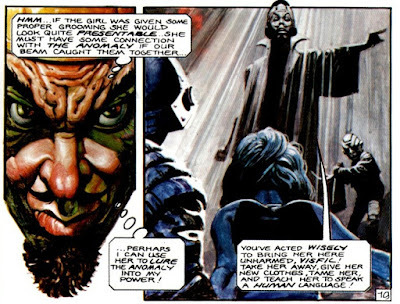 Storm's plan to free Rann's daughter involves starting a fight with the slaver, Redeye. The police almost arrest him--for not giving every a chance to wager first. Though Storm is weaponless and the slaver armed with a sword, Storm wins and Redeye lands on his on blade. Unfortunately, the slaves now become the property of the auctioneer. Rann assures Storm he can get the money to buy back his daughter, but it will take time. Storm another idea: Rann can sell him and use the money to save his daughter, then go get the money to buy Storm back later. He orders her image broadcast via newsfax and telepathic transmitter throughout the system. His hope is that "the Anomaly" (Storm) will see it. 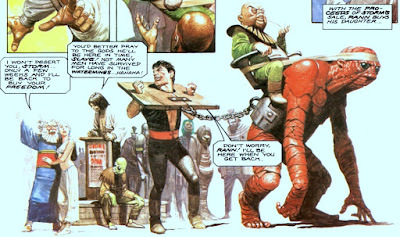 Storm does on a poster as he's being dragged off to the watermines, now regretting his deal with Rann. She gave her name as Dismé and demanded the party put back the chest. After some hemming and hawing they did--except for a silver key, which Waylon the thief pocketed. She told them the Sylaire family was cursed and no one could leave the manor. Only perhaps, someone named Ystyvan could help them. She suggested they try the chapel, then rode off. The party was afraid they were outmatched by this guy and his cat-and-dog-men riders. 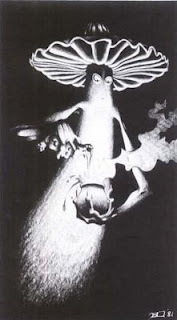 They tried diplomancy, but Herne (as he called himself) only agreed not to attack his "cousin" Shade. The party concentrated their fire on him and took all their foes out surprisingly swiftly. They hoped one of the statues might be Ystyvan. Instead one winked and kissed Shade and her intelligence went up. After almost visiting all the statues, one reached out and touched Dagmar and turned her to stone! 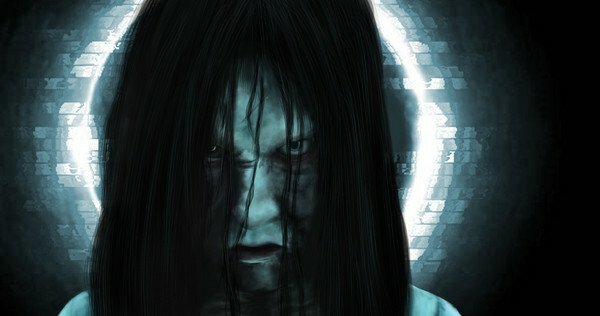 She wanted to find her brother for revenge. Shade panicked and shot her and the party fought with her a bit, before she scuttled past them and escaped. Looking desperately for a place of safety to rest, the group found monk cells inhabited by zombies. They cleared three rooms, but the undead fortitude of one zombie allowed him to comically old on to unlife after being reduced to zero on multiple attacks. After a long rest they explored the rest of the chapel, finding the dead body of a Sylaire family member (presumably Mabdalene's brother) in a library, and a man in golden armor praying in another. After an exchange of pleasantries, he attacked. The wait is over! 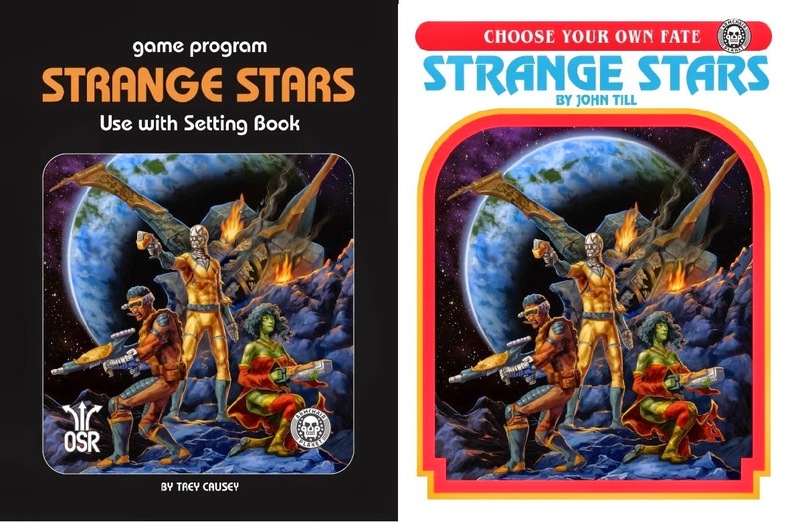 Strange Stars OSR is now available in soft cover as well as pdf. If you're still on the fence, here's our first review to help you decide. 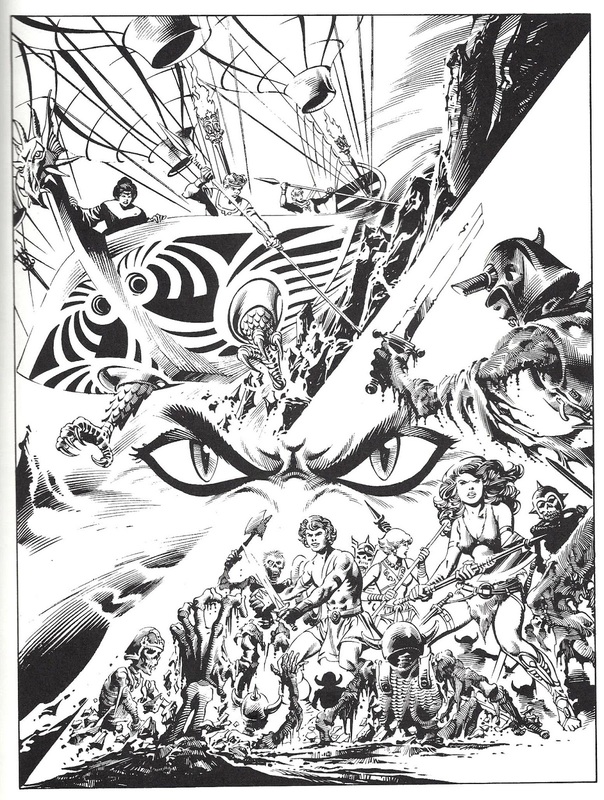 For the Hydra Products that I've been able to work on/contribute ideas to covers for, I like to play on nostalgia, but not strictly nostalgia for rpg books of the past. 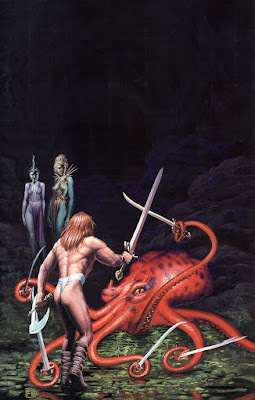 Weird Adventures was meant to evoke the original AD&D Player's Handbook, sure, but also the covers of pulp magazines. I don't know what the final cover will be, but it's an enjoyable process working with talented artists and trying out new designs. Storm will wait a week for a special holiday adjacent edition of Wednesday Comics. The Big Two produced a lot of standard romance titles from the late Golden Age until the mid-seventies, but they also tried to move away from the standard formula. 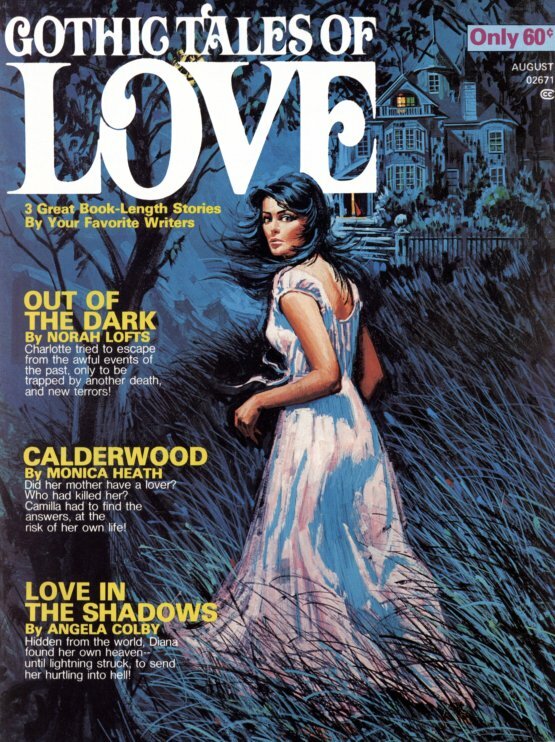 Spurred on by a horde cheap paperbacks and likely Dark Shadows, they delved into Gothic Romance. 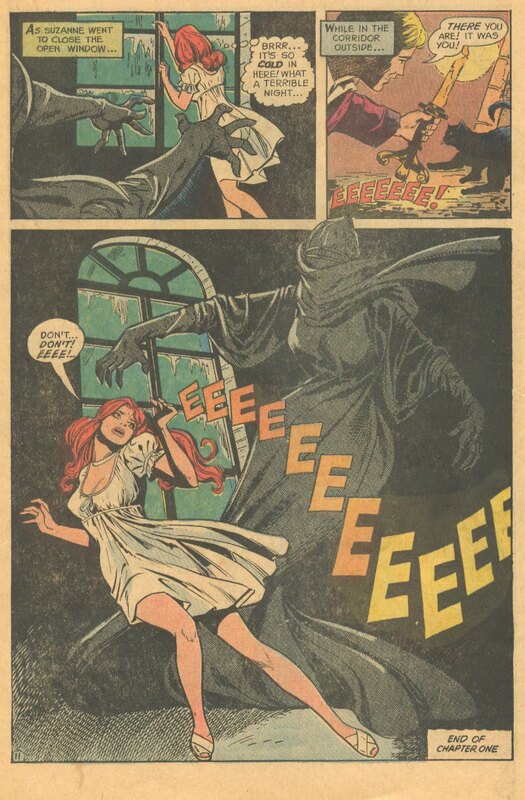 In 1971 at DC, the Dark Mansion of Forbidden Love took its place along side other eldritch property listing anthologies like the House of Secrets and the House of Mystery. 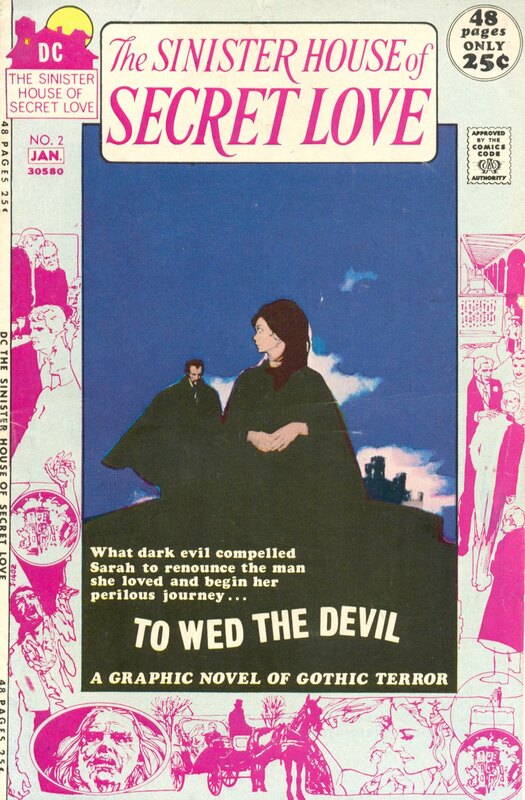 In '72, it was joined by the Sinister House of Secret Love. In addition to having titles that sounds perhaps more boundary-pushing than its actual contents, both series share the same fate of having the romance angle jettisoned. 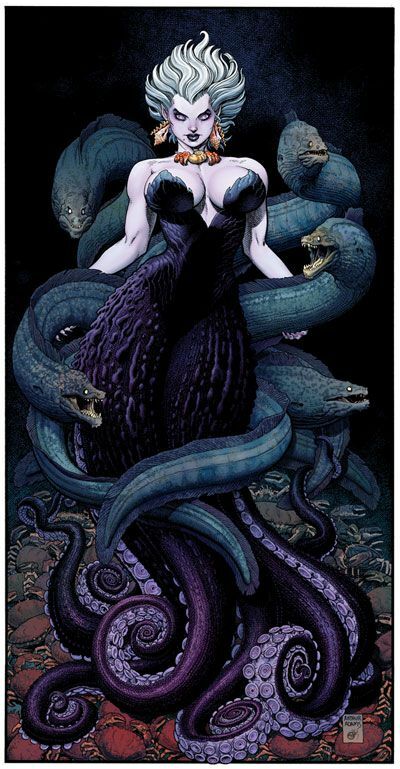 The Sinister House of Secret Love became Secrets of Sinister House, while love also disappeared from the dark mansion leading to Forbidden Tales of the Dark Mansion, both with issue 5. A trend had begun, though. Charlton began Haunted Romance in 1973, Atlas released the oneshot Gothic Romance in 1974, and Marvel's Curtis magazine line in 1975. None of these lasted very long. DC at least has recently revived the title of one of theirs with the Deadman: Dark Mansion of Forbidden Love series. Most of the titles are unreprinted and uncollected. DC did put out a Showcase Presents volume of Secrets of Sinister House that also included the "secret love" days, but it is out of print now. 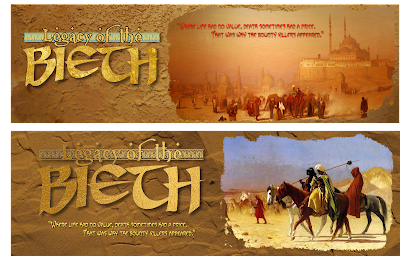 Watching the new season of The Expanse has led me to start thinking about a game I ran in GURPS perhaps decade ago. 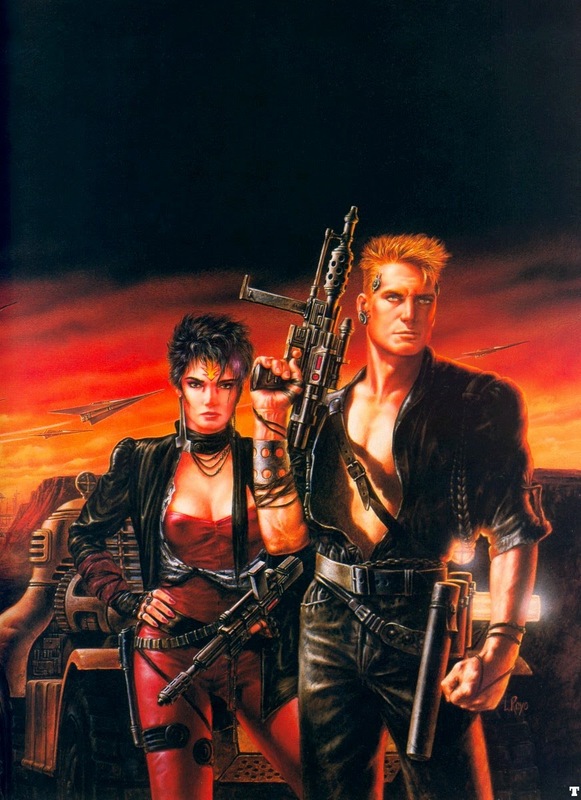 A "hard" science fiction thing using a lot of stuff from Transhuman Space put giving it more of a Cowboy Bebop spin: a little bit cyberpunk, a little bit 70s action film. 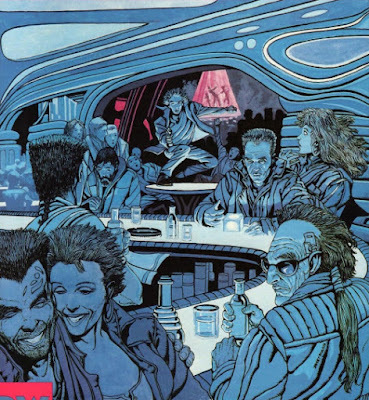 If I ever ran a similar I again, besides using a system besides GURPS, I think I would draw more visually from '80s and 80's sci-fi, borrowing some elements from things like American Flagg! and 80s cyperpunk rpgs. The players' would still be ne'er-do-well, planet-hopping bounty hunters/troubleshooters but with a different skin. A few weeks ago, Rob Barrett made a request in the comments of this post for "more recent SF" suitable for Strange Stars inspiration. In the section on galactic adventuring, I relied mostly on older, well-known and non-science fiction references because I want to convey the idea that the setting is easily accessible and usable for the sort of stuff people typically use science fiction games too do. Hannu Rajaniemi. The Quantum Thief; The Fractal Prince; The Causal Angel. 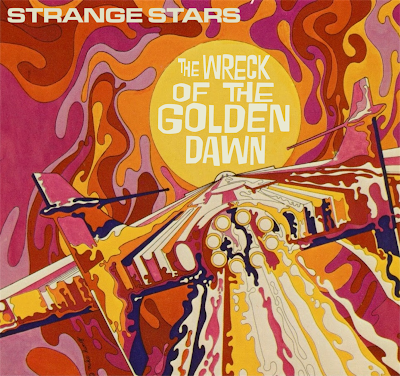 This series is one of the biggest inspirations for Strange Stars, but its influence is diffuse. The interaction of information and physical life that pervades the series is very Strange Stars, as are the exotic societies of Earth, Mars, and the Oort Cloud. Alastair Reynolds. The Prefect; Chasm City. The Glitter Band is a great example of the varied polities of the League of Habitats or the Circus. The Ultras have some resemblance to the Star Folk, if not the same style. Chasm City in particular would make a pretty good Strange Stars adventure. Karl Schroeder. Permanence. The primary inspiration for the metascape is the exoscape of Permanence. Charles Stross. Glasshouse; Accelerando; the books in the Saturn's Children universe: Saturn's Children and Neptune's Brood. The technology and economic considerations in Stross's novels underpin similar concepts in Strange Stars. 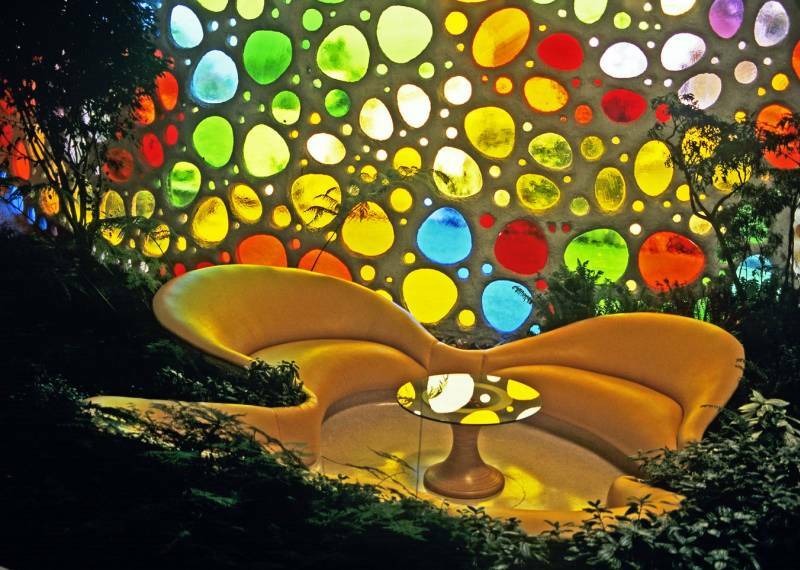 If you want to really get a feel for how I envision fabbers, read Glasshouse. Neptune's Brood also has a very well-realized "water world." Scott Westerfield. The Risen Empire (Succession Book 1). Though I haven't written a lot about military matters in Strange Stars material, the planetary assault and space battle in this book greatly informed what I think such things would look like among "modern" powers in the setting. John C.Wright. The Golden Oecumene trilogy and related stories. The technology of the Golden Oecumene with the trappings of Cordwainer Smith's Instrumentality of man gets you a good representation of the Radiant Polity. The novella "The Far End of History: A Tale from the Last Days of the Seventh Mental Structure" is a great example of what sort of things went on in the Archaic Oikumene. 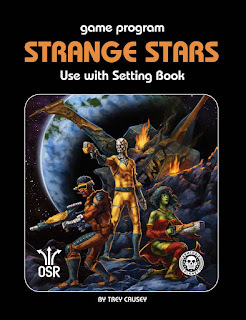 Strange Stars OSR Arrives--and a Special Deal! 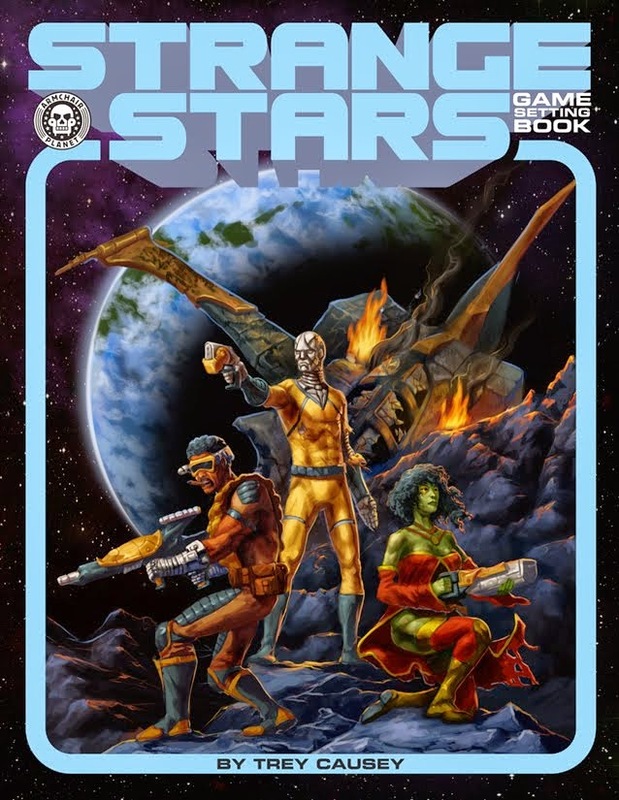 Now you can explore the Strange Stars universe in Sine Nomine's Stars Without Number or similar OSR-derived science fiction games! 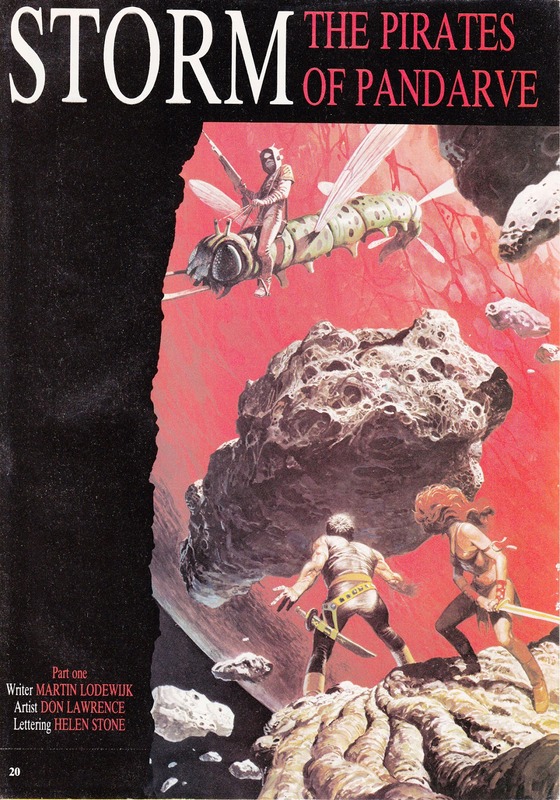 The Strange Stars OSR supplement is now available in pdf. 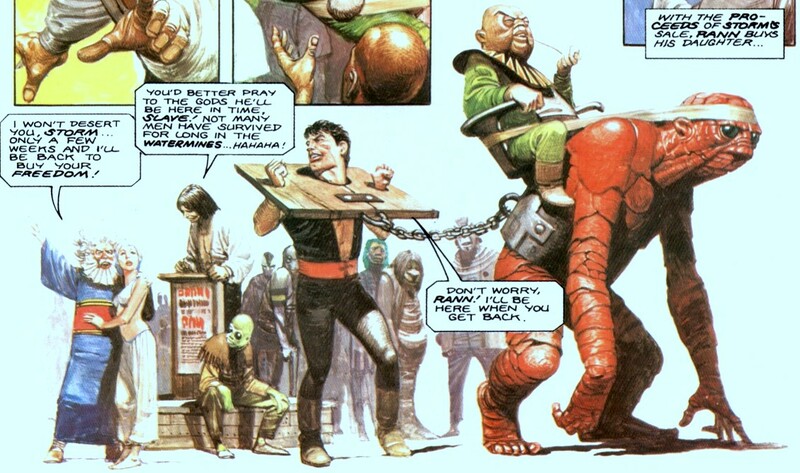 Tips for creatings characters and 19 clades--from Atozan librarians to armored thrax warriors--as player character options. A catalog of adversaries and threats from the monstrous ssraad to the more subtle agents of the Instrumentality. 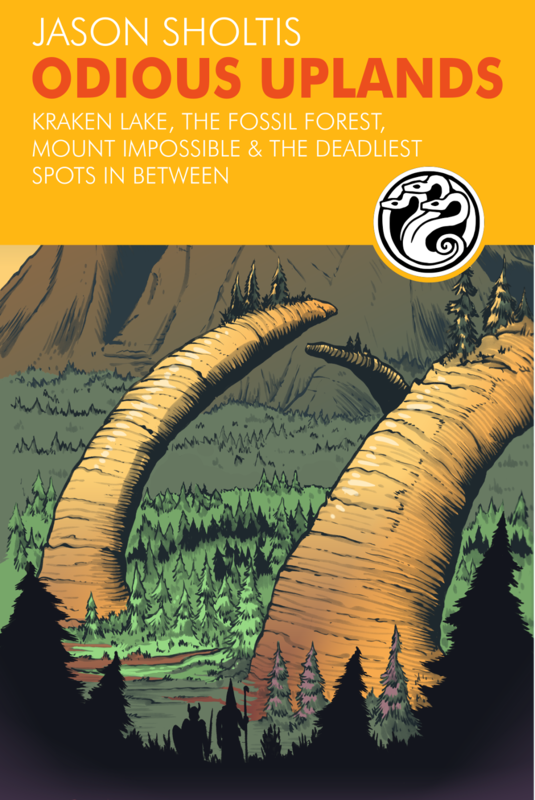 And here's a special deal for early adopters: Everyone buying the pdf will get a coupon for $3.55 off the cost of the soft cover when it's released. 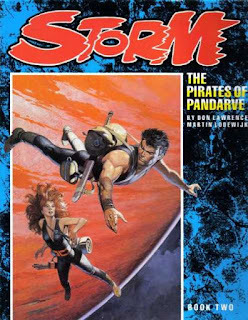 Storm and Rann travel back to find Ember. She is gone, though they do find her bow. Rann is certain she is dead--there are many dangers in space, after all--but Storm can't convince himself. The two locate the ferryman. He operates a hot air balloon that transports people from "orbit" to the only landing zone allowed to visitors--for a price. Rann grumbles about the cost, but he pays it. A Vertiga Bas official greets them when they arrive. He tells them the laws of the Theocrat hold no sway here; there is only one law. For a price, he explains: Do nothing wrong. This actually means: "don't get caught by the police doing anything that might be considered an offense." These who break the law of Vertiga Bas are branded with a yellow circle, and anyone who gets two yellow circles is ejected into "orbit" by a catapult, there to die of thirst and hunger. Storm and Rann don't plan to stay long. They make their way to a bar to try to find information. Storm asks the barkeep if he knows of any ships that have arrived recently with slaves to sell. The barkeeper informs him that asking questions is "considered anti-social in Vertiga Bas." After Rann pays him, the man becomes more helpful: in the Market of a Thousand Jars there is a slave market and a new ship has just unloaded its wares. Rann's daugher goes up for auction. Rann bids 300 credits and wins, but he doesn't have the money on him, but he assures the auctioneer he can get it. In view of his status as a newcomer, they give him one hour to come up with it, otherwise the girl will go on the block again. Rann doesn't know how he can get the money in that short amount of time, but Storm has an idea. Chubby demon idol with temple dancers in hand--or is that an actual demon godling? 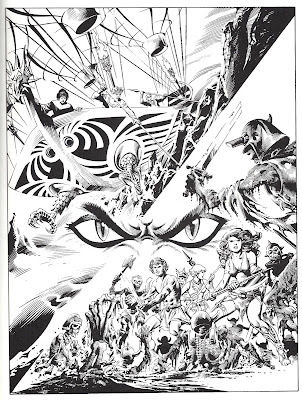 A dragonheaded warrior woman, on the side of the bad guys, I assume. And who's that masked cabal meeting with those warriors? Are they wizards or perhaps priests? Here we see two evil wizards (likely the big heavies) who seem in cahoots but not entirely friendly. 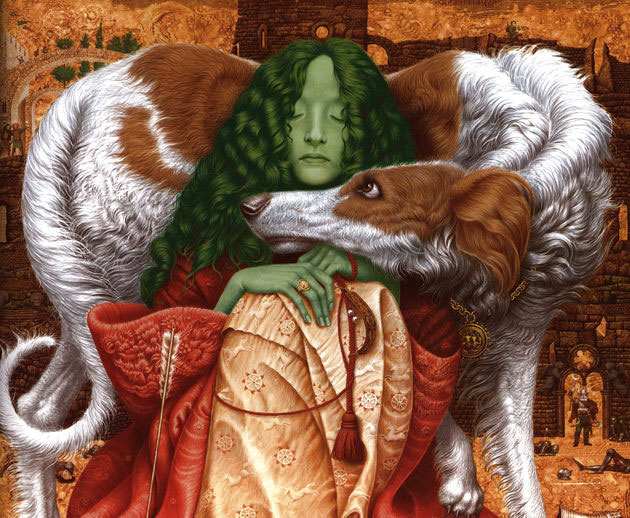 The lady wizard has a spider motif as we see in one of the other images. I bet that ramheaded giant is a guard at one or the other of these wizards' castle. 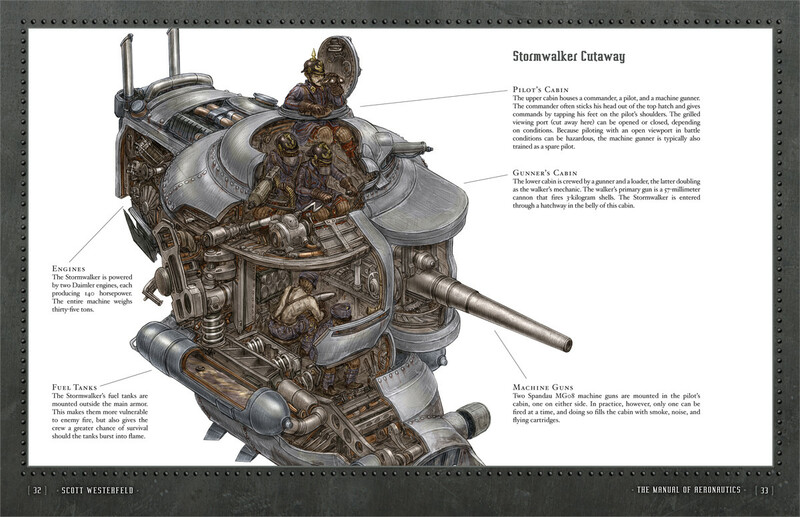 A flying ship and an undead army rising. A assume those angry eyes belong to the wizard woman, but maybe not. 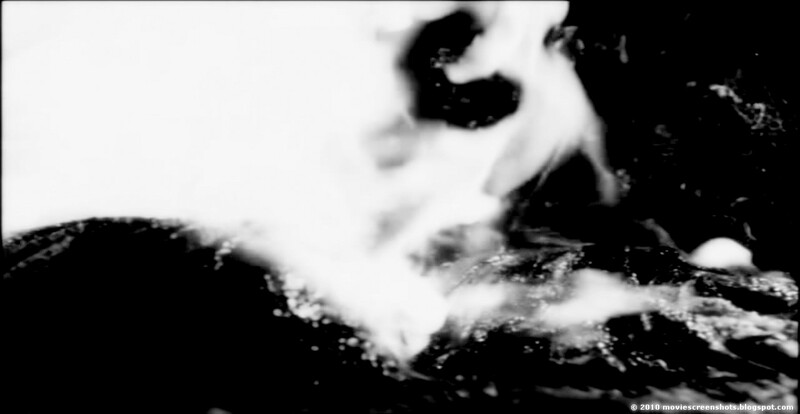 And here, the heroine battles a gillman in some sort of underwater passage. 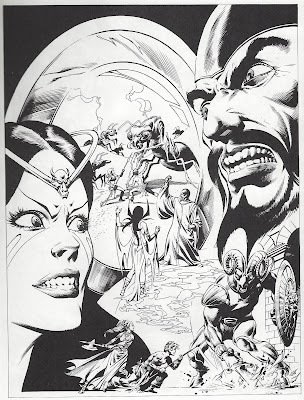 Above, what looks like the two wizards and the reptile woman crush an opposing force. Of course, those are only the most obvious interpretations and possibly incorrect. It doesn't matter, you can be as radical as you want. 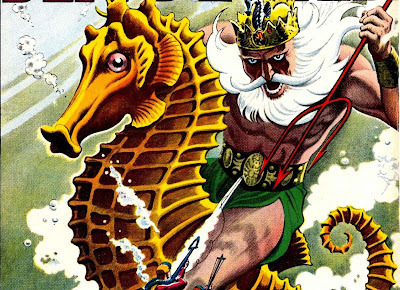 The King of the Sea is renowned for his Hugh Hefnerish lifestyle, maintaining an infamous nautiloid-shaped folly and gardens for his revels. Sometimes, he surrounds it in a bubble of airy water so land-dwellers can join the fun. And b-list undersea celebtriy revellers. Sometimes it's a "good" distraction from getting the rpg writing I need to get done doing logos/headers/cover designs for other people. It's a different sort of work that doesn't feel like work at times. 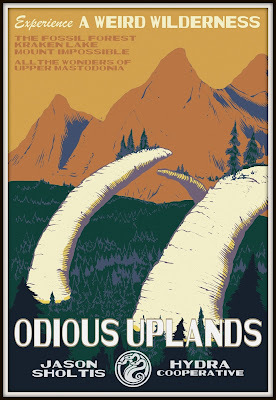 Synopsis: Irving, Woodward, and La Cava go off on a scouting mission and (thanks to random encounter rolls) find evidence that there is a dangerous predator on the loose. Commentary: A low action session, but a lot of exploration. Left without a clear goal, the group explored westward into San Augustin Pass. They see evidence of some sort of burrowing monster. 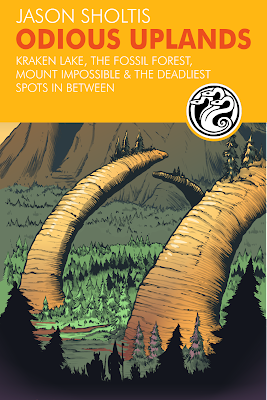 Theories as to its nature include land shark, sandworm, and (based on a sighting) some sort of bear thing. 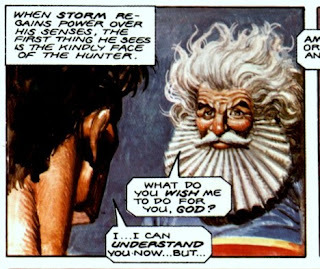 Despite the fact that Rann thinks Storm is a god, he refuses to take him back to rescue Ember, citing the fact he only saves one person a day. When Storm insists (violently), Rann karate chops him and ties him up. After Storm calms down, Rann explains that this tariev (the whale) means life for his family. He has to get it home first, but he will bring Storm back to the place where he found him after. Storm agrees to help. They approach the asteroid Kyrte when Rann makes his home. When they seem smoke rising from where his home would be, Rann fears trouble and they cut free the tariev to hurry back, They find his home destroyed. A dying servant tells the two that the house was attacked by pirates from Vertiga Bas. The Lady Rann and some servants fled into a burning crypt, preferring death to capture, but Rann's daughter fell into pirate hands. 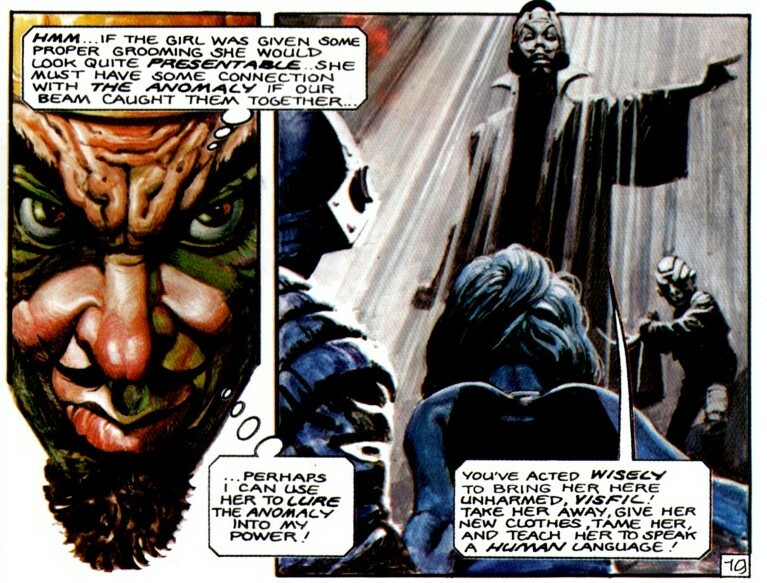 Rann prepares to follow his wife into death, but Storm argues they should try to resuce his daughter. Rann is skeptical, but agrees to try. 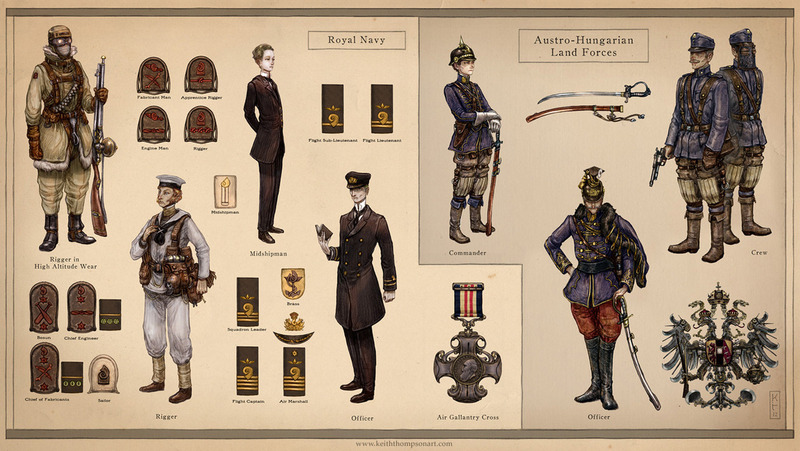 Meanwhile in the palace of the theocrat, his agents present him with what they found when they went to seek the anomaly. Though the anomaly was gone from the coordinates, they did find Ember. 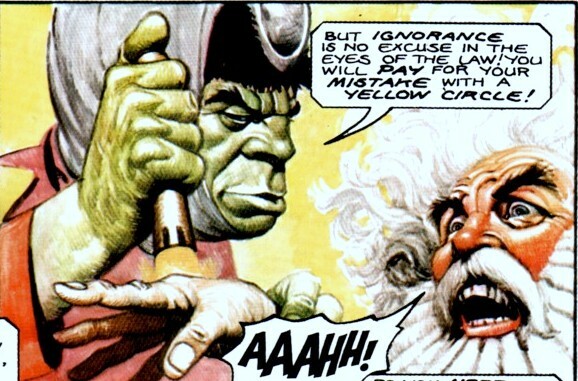 Not knowing their intentions and not speaking the language of Pandarve, Ember fights futilely with the Theocrat's men.